2. Specialized labels for UL/CSA, wine and liquor bottles, cosmetics and shampoo bottles, as well as industrial, toy, automotive, compact disc and video products. 3. Electronics-backlight panels, toy, automotive, compact disc and video products. 1. Modle: MT-5070. 2. Max.printing area: 500 x 700mm. 3. Max.size of screen frame: 800 x 1100 mm. 4. Max.material diameter: Φ500 mm. 5. Unwinder core diameter: Φ75 mm. 6. Max. rewinding diameter: Φ500 mm. 7. Winder core diameter: Φ75 mm. 8. Machine Speed: 600 m/hr. 9. Travel: 800 mm. 10.Thickness of material: 0.025-0.5 mm. 11.Positioning accuracy: Φ0.03 mm. 12.Squeegee drive motor ( servo ): 0.75kw. 13.Take up drive motor ( servo ): 1kw. 14.Unwinding motor: 1 HP. 15.Winding motor: 1 HP. 16.Platen vacuum motor: 1/2 HP. 17.Take up roller vacuum motor: 1/4 HP. 18.Air compressor motor: 2 HP. 19.Working air pressure: 5-7 kg/cm2. 20.Machine dimensions( L x W x H ): 1350KGS/L3750x W1560 x H1900( mm). 21.Winder dimensions( L x W x H ): 350KGS/L1100 x W800 x H1100(mm). 22.Rewinder dimensions( L x W x H ): 450KGS/L1100 x W800 x H1100 (mm). 7. Photocell sensor detection around the machine provides extra safety for the operator and machine. 8. Winding and unwinding use air shaft to prevent slippage,and include advanced web guide for precision and neatness. 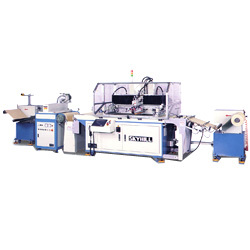 10.Winding mechanism utilizex advanced sonar sensor for accurately sensing transparent and non-transparent film. 11.Precision linear motion guides are provided on vertical and horizontal slideways for extremely smooth and stable traverse. 12.Two types of drying device available:hot air drying and UV curing(optional).